Note: This is the final blog entry to be posted in both Caring Bridge and here. I owe Caring Bridge a big thanks for providing such a great platform for communicating about Timothy’s early health issues and later about our life in a bottle with TRBL. First, why did I write this blog? 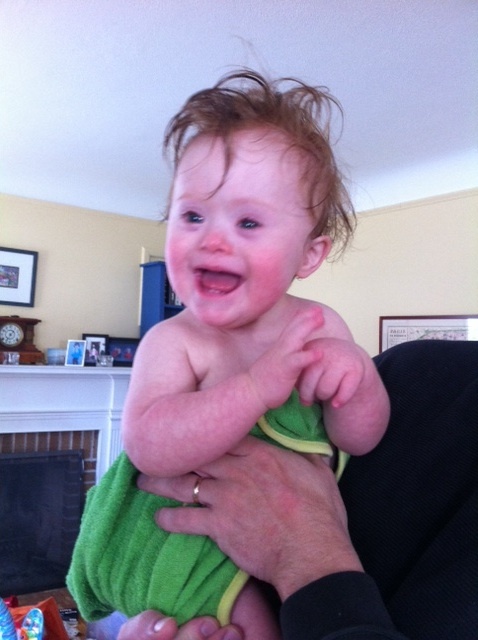 I just started writing the Caring Bridge blog because that first week of Timothy’s life was exhausting and we were too tired to keep our friends and family updated, especially when we were dealing with the very mixed emotions of a brand new baby but one with Down syndrome (I did have to do a little double take at the red hair as well). As I wrote the blog, I realized that it was a good way to capture how things were developing and how our household changed as a result of the little dude. But as I started coming face to face with Down syndrome, I realized just how uncomfortable I was with people with disabilities. I didn’t used to stare at people, but was terrified of saying the wrong thing (“he looks funny – what’s wrong with him?” and “does he eat and sleep like a real person does?”). So I did what most everyone does — avoided them. And that behavior, while very normal, just reinforces the isolation that many, probably most, people with disabilities and their families already feel. As I wrote the blog, people told me that it helped them understand a little better about life for people with disabilities. So I have kept writing this, both to document the path that this wacky little red head paves for us every day, and also to de-mistify the junk about disabilities. I want people to know that if they have a child with a disability, they’ll get through the initial shock and will be fine. I want people who have never been exposed to disabilities to realize that these are people, and not only do you not need to avoid them, but you can even reach out to people with disabilities and get to know them. Because our family, which has always been a pretty dang cool group of people (myself excluded), is just as goofy and fun now as before August 29, 2011 when Timothy arrived. Many of the issues associated with disabilities are not so wildly different from the fears and challenges most of us face in some parts of our lives. For us, the sand in the oyster is Down syndrome, but most everyone has faced or will face some real challenges, and so I think our experience is actual pretty universal (or at least as universal as a family with 3 kids with three different colors of hair and an age span of 15 years could be). So I appreciate people reading the blog and being open to these different elements, which are often funny, but can also be sad, but which show the whole picture for us. There’s a little of everything here, and a lot that we can laugh at and even more to be grateful for. And that’s why I’ll continue to write the TRBL blog. One last, less editorial, Author’s Note: One addition to the injury report from the prior entry — I probably have a little hearing loss in my left ear after Timothy screamed in that ear for 15 minutes as I held him last night, trying to put him to bed. Ironically, Timothy goes in Friday morning for his big ABR hearing test. Maybe his screaming was his attempt to level the playing field a little. Our sixteen year old daughter, Elisabeth, is officially headed to India to spend her senior year of high school on a Rotary scholarship. We know that this will be an incredible experience and we’re confident that she’ll be safe, but it will be quite a change for all concerned, including those of us left stateside. In addition to some language courses and other preparation for India, Elisabeth needs to finish some online courses to graduate on time because we don’t know the transferability of her courses in India (ummm, will the ‘Meditation with yogi’ class count as a credit for Math or English? ), and get most of her college search done (ACT/SAT, college visits and applications). It’ll be a full Spring. Our house was built in 1949, and has a few neat craftsman features, one of which is the little mail slot inside the front door. The painted white door sits a foot above the floor, outlined by the blue wall. As Timothy prowled the floor in search of new adventures, it was inevitable that he and the petit white door would meet. The cute knob on the mail door is just asking to be pulled, and Timothy has been more than happy to oblige. After enjoying 62 years of daily openings and closings, the mail door – just like the Turkish rug before it, which had outlasted decades of Middle Eastern conflict — became a household victim of the active, curious toddler. When you have an infant who still spits up sometimes after meals, everything in the house is a potential burp cloth. In best case scenario, you have an actual burp cloth with you. Sad to say, the next best scenario is he spits up on you, which, while not pleasant (especially if you’re about to go somewhere), requires a change of shirt but not much immediate clean up (though Laura might disagree on the laundry end of things). As a note, he is pretty good about not getting the mess on himself. But oftentimes, the spit up hits the ground and you don’t have a burp cloth. In this case, you are a surgeon operating without a scalpel. Once that spit up reaches the floor, your eyes lock with Timothy’s as you both realize the stakes. If he gets to the puddle first, smearing and clapping and general mirth (for him) will ensue and complicate your clean up effort. The key is to quickly and gently move the child away from the puddle to a safe location. Then the clean up begins. A small spill on the floor can be quickly blotted up with your sock (a cotton gym sock is ideal, but a dress sock soaks through too easily). I don’t recommend it, but if it’s small enough I just grab it with my hand and wipe it on the side of my pants (I hope no one is eating while they read that), which explains why I have pants for home and pants for work. A larger spill means you need to marshal some resources, and you just hope that the yellow police tape keeps the helpful toddler from returning to the scene of the crime. Now, I won’t try to sum up everything we’ve learned (after all, I need something to write about on www.timothylee.org), but here is one of my bigger recent revelations. Timothy is exactly who he should be. This sounds simple, but it’s taken me a long time to really and truly believe this, and I would not have believed that sentiment before our experience with T mobile. It means focusing on what he has, and not what he’s missing. I have, since Timothy’s arrival, sometimes (probably often) fallen into dwelling on his disabilities (if this contradicts some of the lessons I profess in the blog, it’s possible that I’m not yet as consistently enlightened as I appear on the computer screen). We have a boy who seems well behind key early developmental steps that we saw in our other two daughters, AND we have this big, permanent label of ‘Down syndrome’, and so it’s natural to focus on those negative differences and to be a little sad and disappointed. 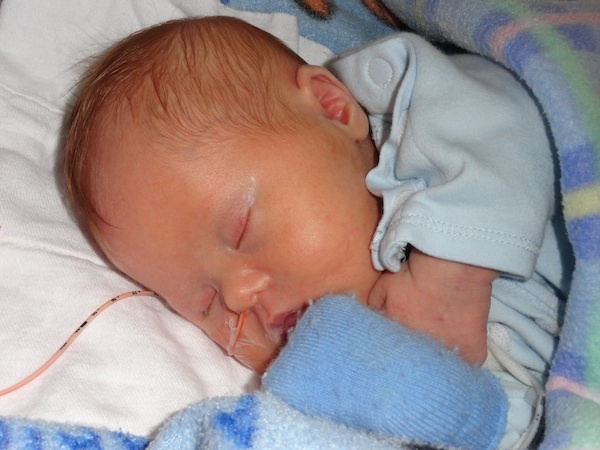 We know that many of those developmental delays will never ‘catch up’ for Timothy. But we won’t stay sad and disappointed. We have to be able to acknowledge the issues presented by his condition, and move forward in a positive direction. In the past, I’ve heard parents of kids with disabilities say that their kid is “a child first”. I understood why they would want their kid treated this way, but to me, it sounded like a naïve rationalization. I was sad for those poor parents of kids with disabilities, but I couldn’t relate — I thought they were kidding themselves and ignoring the glaring limitations their children faced. I was respectful to people with disabilities, but with an undercurrent of sympathy, probably an air of superiority, and I could not see past their disabilities. But now I believe and have internalized the ‘child first’ philosophy. Heck, I believe and have internalized the ‘child’ philosophy. Again, this does not deny the seriousness of some of his differences. But I refuse to focus on deficits and start from a position of sadness and pity. I will work with the clay that we have, and start from a position of hope and optimism just like we did with our daughters. I’ll be careful how I articulate it, since it’s confusing and I didn’t feel this way before going through this experience for more than a year. For me, this realization is a deeper level than ‘make the best of the situation’ or even ‘accept or come to terms with the Down syndrome’. He’s as perfect as his sisters, Elisabeth and Catherine. I could not have said that a year ago and really meant it. 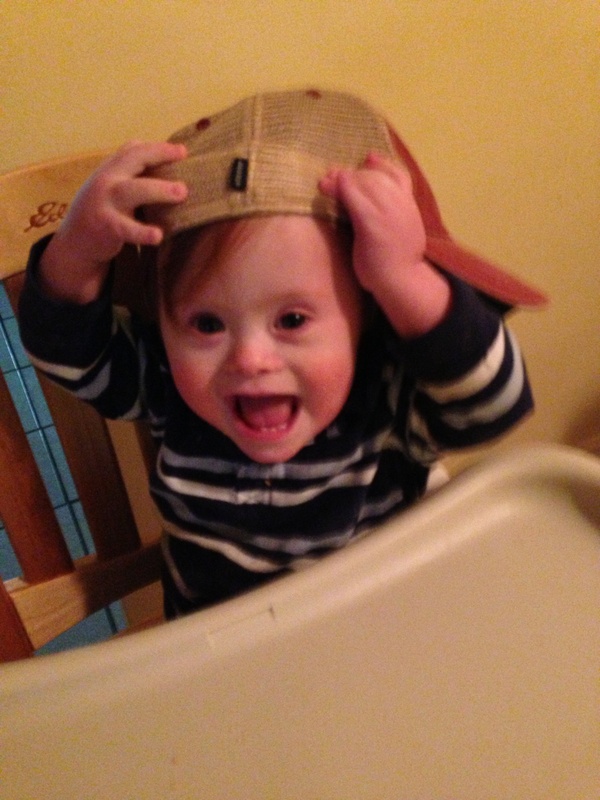 This is about Timothy and not defining him by Down syndrome (or red hair). It’ll be very natural for people to say “he has Down syndrome” and to assume that he can’t do X, Y or Z. And in some cases, they’ll be right. But in order for other people – teachers, peers, etc – to treat him as Timothy and not just as a boy with Down syndrome, it starts with the Lee family. We have to truly believe in him, we have to role model that and raise him to believe it himself. Our first blog entry, which contains my favorite opening and closing sentiments, is a fitting way to close the Caring Bridge experience. 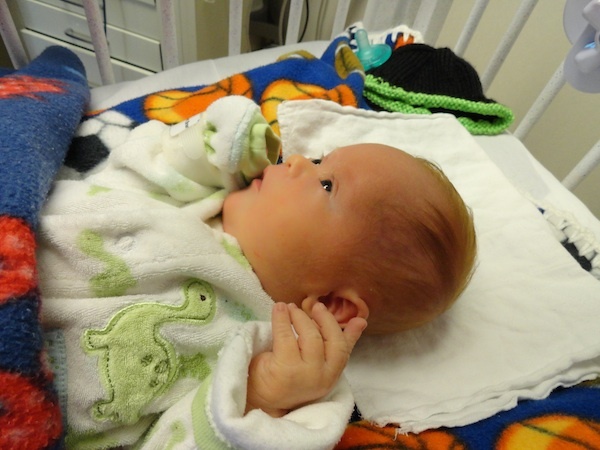 I wrote it on September 1st, when Timothy was 4 days old, and we were anxious to get him home, but he was on the verge of colon surgery and another two weeks at Children’s hospital. We were right. Timothy is amazing. And we have so many reasons to be grateful. 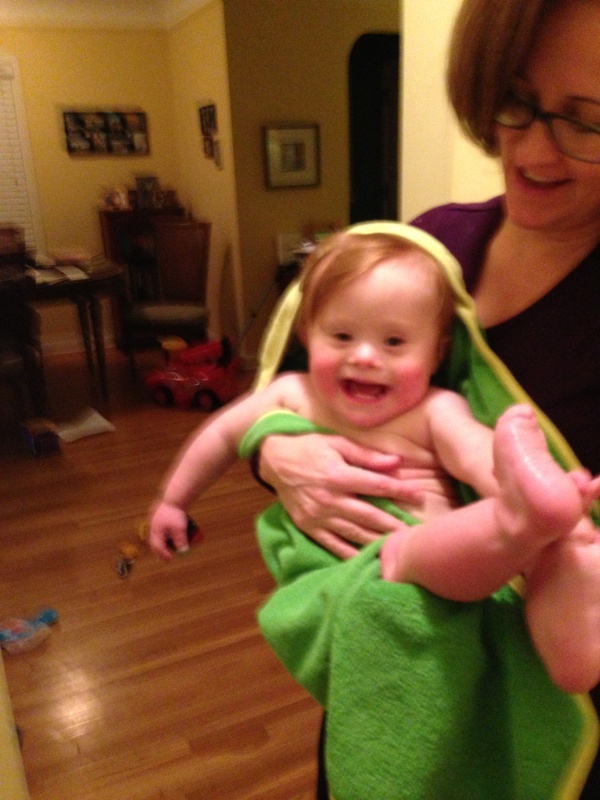 This entry was posted in Down syndrome, grabbing, Parenting lessons -- Don't try this at home, Spit up, Too much advice and tagged ABR test, Boy destroying house, Burp cloth, Disabilities, Elisabeth in India, Why I wrote TRBL blog. Bookmark the permalink.